TCDD is a contaminant found in Agent Orange - a herbicide used by US troops in the Vietnam war and blamed for serious health problems. Mr Yushchenko, who faces PM Viktor Yanukovych in a repeat poll on 26 December, fell ill in September. Scientists say the poison could not have occurred naturally in his blood. "It is a single chemical, not a mix," Prof Abraham Brouwer of the Free University in Amsterdam told the Associated Press. "This tells us... there is no way it occurred naturally because it is so pure." Initial tests had shown the level of poison in Mr Yushchenko's blood was more than 6,000 times higher than normal - the second highest level ever recorded in humans. 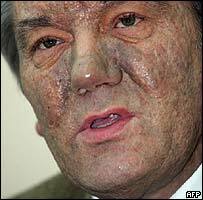 Doctors in Vienna had already said dioxin poison was to blame for Mr Yushchenko's disfigured face but until now the exact chemical was not known. They said there appeared to be little lasting damage to Mr Yushchenko's internal organs, though experts believe it could take more than two years for his skin to return to normal. Mr Yushchenko first claimed that he had been poisoned in September, when he was admitted to a clinic suffering from stomach pains. It was only slowly that his face began to change and the blisters transformed his previously youthful looks. Ukraine's parliament is reopening its inquiry into the poisoning claims - the first probe said the presidential contender had had a viral infection and other diseases.